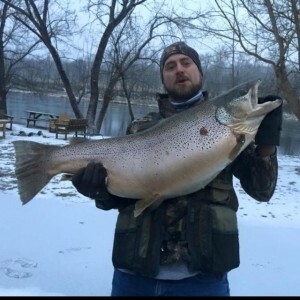 The White River record Brown Trout was caught from the river bank at Rainbow Drive Resort. This record catch came on February 27, 2015. Calvin Johnston from Olathe, Kansas landed this 38-pound, 7-ounce, 36 1/2 inch brown. Calvin was wading from the river bank at Rainbow Drive Resort fishing the Rainbow Hole, which is located in front of Rainbow Drive Resort. This isn’t the first 30+ pounder that’s come out of this hole. Rainbow Hole is well know as an excellent fishing spot on the White River. This is the third recorded 30+ pound brown trout caught in the past 10 years and we have 5 to 15 pound trophy trout caught frequently.